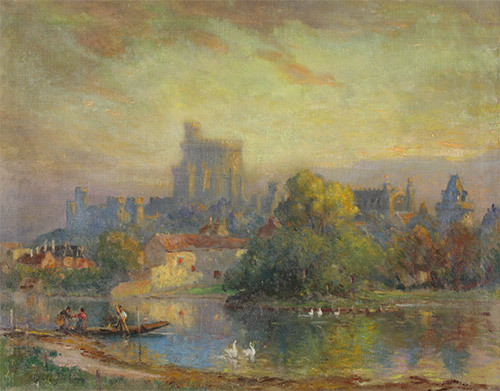 A resident and distinguished impressionist painter of both the East and West Coasts, Colin Campbell Cooper earned an international reputation with his depictions of landscapes, florals, portraits, gardens, interiors and figures. He was especially noted for street scenes and skyscrapers of New York and Philadelphia, and his impressionist* palette was inspired by Childe Hassam, whom he met in New York beginning in the 1890s. In the later part of his life, he focused on West Coast subject matter and espoused The California Style* of watercolor painting, a bold, aggressive new oil-painting look to a medium that had traditionally been used more modestly. He was born in Philadelphia to an upper class family where the father was a surgeon, and he, the son, was encouraged by his educated family to pursue art. He was also inspired by the art he saw at the 1876 Philadelphia Exposition*. He studied at the Pennsylvania Academy* of the Fine Arts with Thomas Eakins and in Paris at the Academies Julian*, Vitti, and Delecluse*. During that time, he traveled throughout Europe and painted picturesque architectural scenes, which gained him widespread recognition. Sadly many of these paintings were lost in a fire of 1896. From 1895 to 1898, he was instructor of watercolor at the Drexel Institute in Philadelphia and then moved to New York City from where he and his artist wife, Emma Lampert, traveled throughout the world in search of subject matter. On a European trip in 1912, they sailed on the Carpathia and became part of the rescue operation of the sinking Titanic, an experience that Cooper depicted in a painting, View of Steamship Carpathia passing along the edge of the ice flow after recuing survivors of the Titanic (1912). The Coopers first went to California in 1915, spending the winter in Los Angeles and in 1921, settled in Santa Barbara, where he served as Dean of Painting at the Santa Barbara Community School of the Arts*. He was a member of numerous associations including the California Art Club*, Salmagundi Club*, and the National Academy of Design*. His work is in many museums including the Cincinnati Art Museum, the St. Louis Museum, and the Oakland Museum. Cooper died in Santa Barbara.